March 22, 2016 · I AM Group · Comments Off on Let’s Bowl! 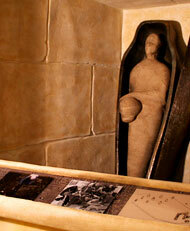 This month’s post coincides nicely with our bowling event which occurred on Saturday, March 19. When it comes to sports activities, bowling is no doubt one of the best for building camaraderie, and friendship. Gathered around a lane, bowlers can play on a level field against people from any demographic. There is no limit. In this article we’d like to offer a brief overview of bowling as a sport, and then focus on wheelchair bowling and the advances made in adapting bowling for people of all abilities. In particular, we will focus on Paul O’Hora, a Scranton native whose advocacy and inventive spirit allowed for many to see the possibilities available if you are only willing to try something new. The sport of bowling has a very rich history. According to the website of the International Bowling Museum & Hall of Fame (IBM), “A British anthropologist, Sir Flinders Petrie, discovered in the 1930’s a collection of objects in a child’s grave in Egypt that appeared to him to be used for a crude form of bowling. If he was correct, then bowling traces its ancestry to 3200 BC.” In any case, there have been many versions of games where a ball is thrown at pins, which most likely means that the modern game of bowling was continually modified, and not merely invented in one place. As we have seen with other sports, wheelchair adaptations for bowling came out of social and physical rehab programs developed for veterans returning from World War II. There is not a lot of published information about bowling as a wheelchair sport, mostly because adaptations consist of specialty apparatus. 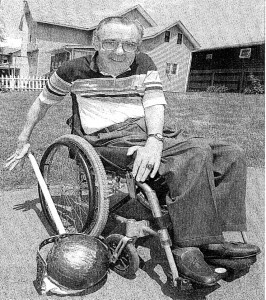 However, a significant event in it’s history is certainly the creation of the American Wheelchair Bowling Association (AWBA) in 1962 through the vision of bowler Richard F. Carlson. Since the founding of this group, it has grown to have over 500 members and an average of 10 tournaments a year spread throughout the country (for more information about the AWBA see their website, here). This brings us to the main focus of our article this month, Paul O’Hora. Mr. O’Hora, began bowling at the age of 23 with a group of co-workers at Harper and Row Publishers. Later he found that he had to overcome an unexpected obstacle when he fell from a roof while building a country house in 1954, sustaining a spinal cord injury. However, through trial and error, while working with staff at the Wilkes-Barre Veterans Administration Hospital, he came up with an invention that allowed him to continue in his passion for bowling. His invention became known as “the stick,” a device made up of an aluminum rod with two side points a few inches above the floor to steady a bowling ball. A small wheel in the rear enables the ball to roll, and hard fiber skis slide along the floor. A hand strap at the top of the stick allows the user to push and control the ball. 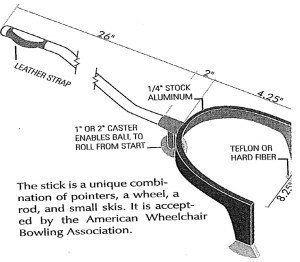 This invention allowed Paul to control his bowling play, and to continue his bowling career, even winning several titles, including the 1965 American Wheelchair Bowling Association’s Scratch Division title. 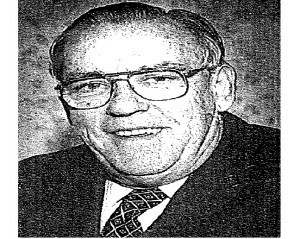 In addition, Mr. O’Hora was a charter member and past president of the AWBA, and appeared at five National Veterans Wheelchair Games, winning gold in bowling and 100 and 200 meter races, and bronze in billiards. Finally in his list of bowling achievements, O’Hora became an inductee in the AWBA Hall of Fame in 1976, one the first inductees. I would like to finish this article by taking a brief look at other adaptations for wheelchair bowling. First of all, there are many adapted stick devices that are similar in some ways to Paul O’Hora’s stick. Mr. O’Hora never held a patent for his invention, and was okay with companies appropriating his stick design. So, today there are many companies which sell push sticks for wheelchair bowlers. In addition, a popular device is a bowling ramp. This device allows the bowler to rest the ball at the top of the ramp and release the ball down the lane, either with a quick release button or by pushing the ball. With that in mind, let’s get out there and bowl! Next Want to Be Part of Disability Awareness Week?